I made this diagram for fun. It describes the way that I think a library’s web site fits into a typical library organizational structure vs. a larger public service driven user-experience analysis. “Rep.” stands for representatives from different departments, appointed by the director of that department. 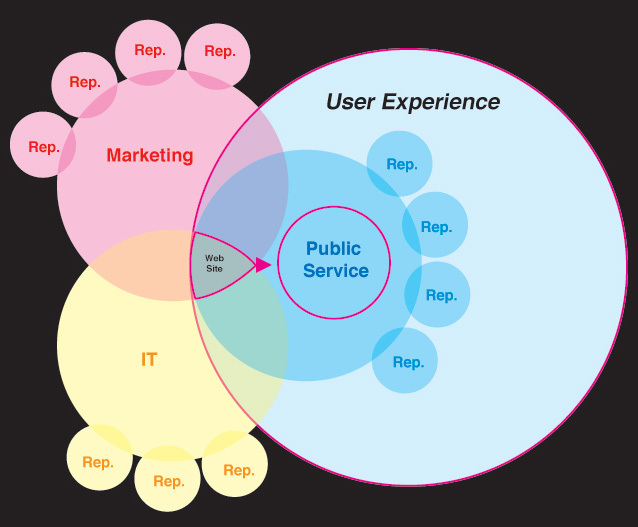 The size and shape of the diagram, as well as the names of the departments would be different depending on the structure of whatever library system, but the overlap of departmental interests should remain constant.